Home Food & Drink Why Do Tequila Bottles Have Worms in Them? Why Do Tequila Bottles Have Worms in Them? When saddling up to the bar, millions of people worldwide choose to throw down a few shots of the ultimate Mexican party spirit known as tequila. With a long legacy dating back 2,000 years, tequila was first commercialized in 1656 by Jose Cuervo. By the late nineteenth century, the potent alcoholic drink was imported into the United States and started growing the international popularity it continues to enjoy to this day. While most tequila fans fully appreciate the strong smoky taste and power of tequila, most of us have no idea why tequila bottles have worms in them. Where this tradition has come from? Tequila Semantics: Does Tequila Have a Worm in It? Is the Worm in Tequila Alive? First of all, does tequila have a worm in it? It is important to realize that there is actually no worm in tequila bottles. All high-quality premium brands of tequila (and even the cheaper brands you find at the liquor store) will never feature a wiggling little critter inside its bottle. True imbibers of the alcohol can attest to the fact that worms are only found in tequila’s lower-class sister, which is known as mescal. Therefore, whenever you find a bottle of tequila with worm inside, there is a 99.9% chance that it is not even really tequila at all. Mescal is an umbrella term that is used to describe multiple kinds of distillates that are derived from the agave plants that mostly grow in the state of Oaxaca in Mexico. While tequila can only be made with one species of plant called blue agave, mescal is produced from a wide variety of agave plant species. Secondly, the worm that is found within bottles of mescal is actually an agave worm, which is the larvae of moths. The reddish colored caterpillars are also referred to by their scientific name of Hypopta agavis. Since the main ingredients within both tequila and mescal are agave plants, the alcohol is prone to these tiny worm creatures that use these plants as their main habitat. However, when the agave worm is discovered during the process of producing tequila, it is actually a very bad sign. When the worms are found within the heart of the plant during processing, it is often a warning that there has been an infestation that will severely lower the quality of the product and its taste. Manufacturers of premium brands will go to extensive lengths to avoid agave worms within their tequila, but the worm has become a staple of mescal. In 1950, entrepreneur Jacobo Lozano Paez from Mexico City created the marketing gimmick of placing an agave warm in his bottles of mescal. 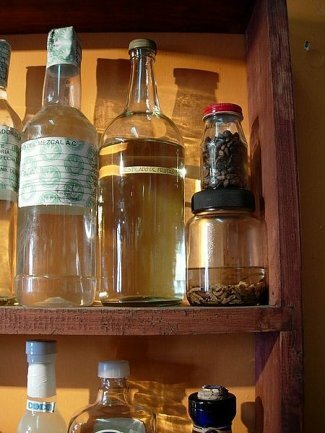 Worms are considered a delicacy with aphrodisiac characteristics in many parts of the Mexican nation, so Paez believed that the presence of a worm within the drink would improve both the color and taste of the mescal. While many aficionados of tequila declare that the worm serves no purpose within the drink, others argue that the white worm that lives on the leaves is not as tasty as the red ones found in the plant’s heart. Whether or not the mescal actually has aphrodisiac or hallucinative qualities remains moot because the gimmick has withstood the test of time. Although some tequila producers tried to ban the agave worm in mescal in 1995, the Mexican Department of Health determined that the creature posed no health dangers. As many frat boys have proven for decades, in addition to being a fun drunken dare, the worm is safe to consume – its merely a source of protein that has been well-pickled to eliminate pesticides and bacteria. In fact, it is now considered an important Mexican tradition to receive mescal with the notorious worm inside the bottom of its bottle – but technically speaking, its not “Tequila”. What’s the Difference Between Fruits and Vegetables? Malt Liquor Vs. Beer: What Are the Main Differences? How to Make Strawberry Wine? Why Do Dogs Eat Poop? What Does A Nuclear Engineer Do? – Nuclear Engineering Job Description What is the Best Nail Polish Right Now? What Causes Kidney Stones? 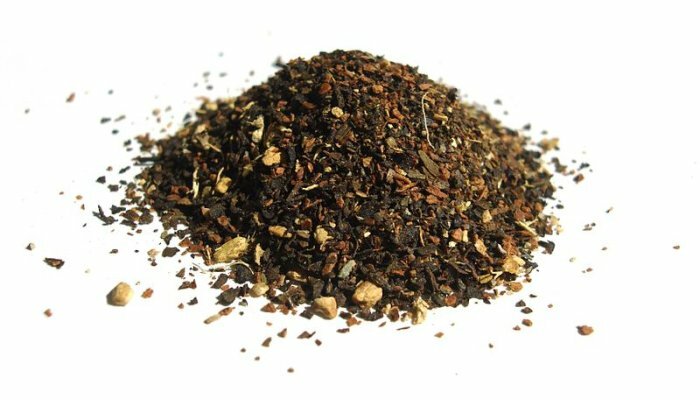 What Are The Health Benefits of Chai Tea?